This past week we caught fish in a variety of locations including the Hump, QA, Bell Buoy, Howe Sound, and Thrasher Rock. The Hump is usually the place to be this time of year and should be peaking right now, but for whatever reason it has not been as good as previous years. This could quickly change as we often have good to excellent fishing on the Hump in the first two weeks of May. 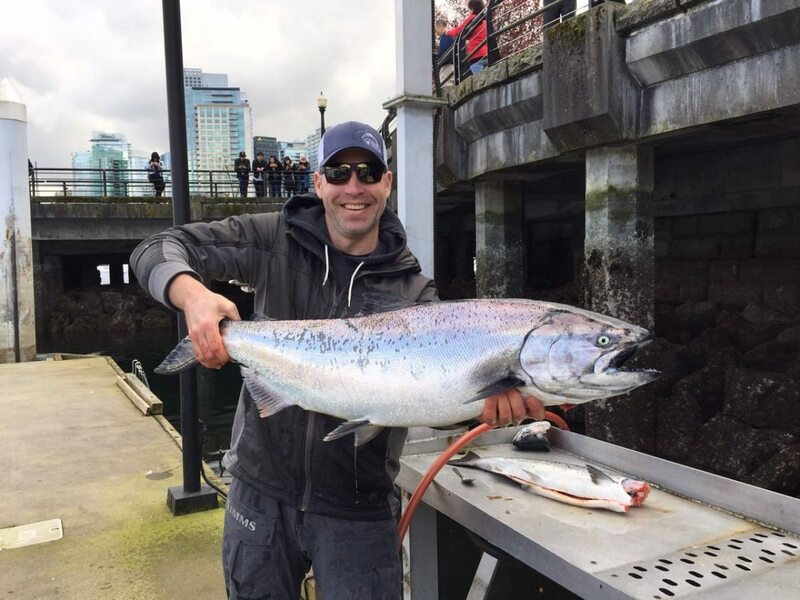 There have been a lot more fish showing up in the Nanaimo area so there could be some more fish coming down our way on this side of the Strait of Georgia and this would make things pick up on the Hump. 2 nice ones from a trip where Dimitri fished the Hump and QA this week. There have also been some fish caught off the QA and the Bell Buoy. 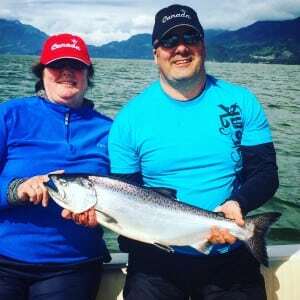 On days where the NW wind has made these areas too rough to fish we have been hiding up in Howe Sound and have found some fish there. 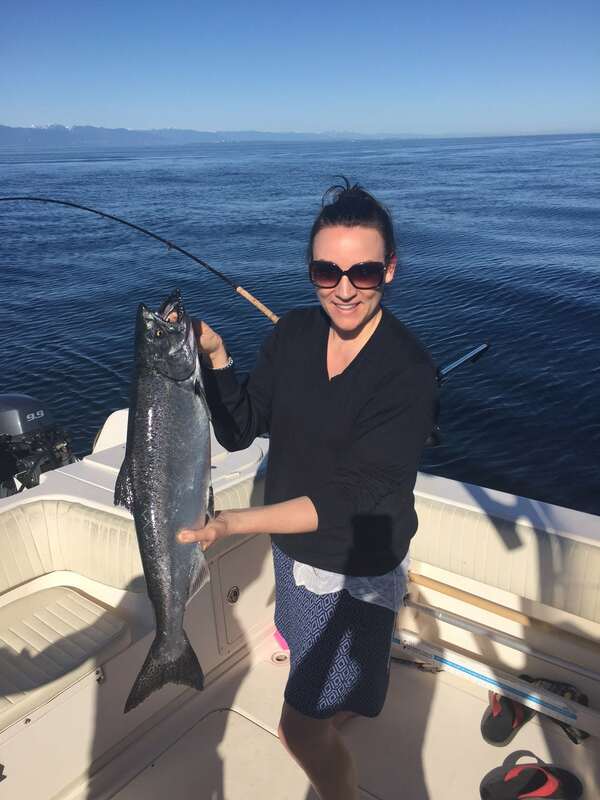 A nice chrome chinook from one of our Howe Sound charters this week. We have also made our first trips over to Thrasher Rock this past week and the fish are there as well as a little further up in Nanaimo. Thrasher will only get better as we get into peak season in mid May. Jason did a trip to Thrasher this week and guest Tania is holding up the first one of the year from that location! In our local waters of the Belly Buoy, QA, Hump, and Howe Sound, the water has been dirty with run off from the Fraser River, Squamish River, and algae blooms. For the most part this keeps the bait and the fish fairly shallow. Hot depths have been 70-130 with a lot of action in the 80-100 zone. Try a little shallower early in the morning and a little deeper mid day or on sunny days. In our local waters mentioned above the hot flashers have been the Salty Dawg, Green Onion Glow, and Chartreuse Glow. Bait and spoons have been working well. The usual spoons with some green and glow have been producing such as the O’Ki Tackle Titan in Mojito and Homeland, the Kingfisher in Irish Cream and Flaming Hans, and the Pesca in Janitor and Tossed Salad. The bait we have been seeing in the stomach contents of the chinook has been around the 4 inch size for the most part. Over at Thrasher if you are in dirtier water that has been pushed across, the same productive depths and lures apply. If you are in the clear water the fish have been much deeper, in the 170-225 range on the downriggers. When fishing this deep we do very well on double glow flashers and make sure your spoon glows. Charge it up before you send it down by leaving it out in the sun or using a flashlight. Another very productive lure at these depths is a glow hootchy. We prefer the Yamahsita in the following colours OG144R, OG142R, OG151R, OG140R. These are the glow splatter back series in shades of blue, green and chartreuse. Try a short leader in the 32 to 40 inch range. 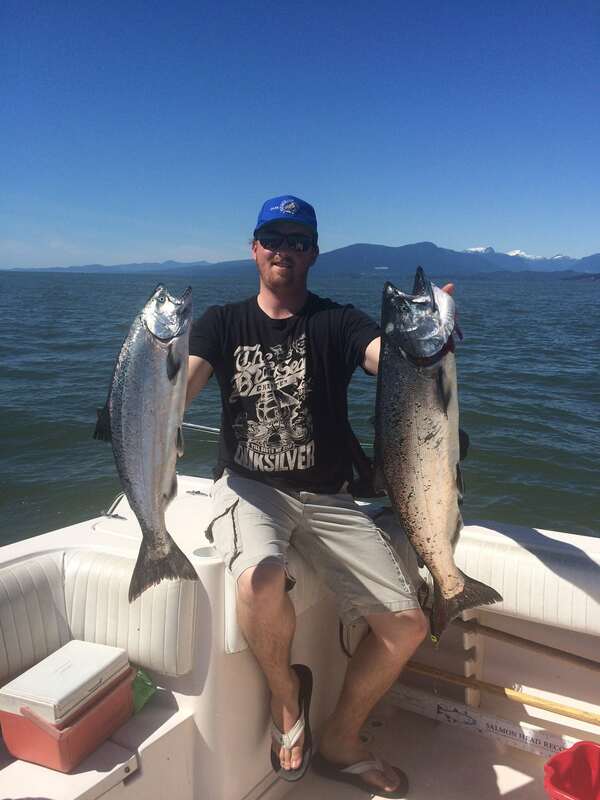 So as you can see, there are a lot of options right now and we are catching some nice chinook! Crabbing has also been excellent. If you would like to book a trip please give us a call at 778-788-8582.